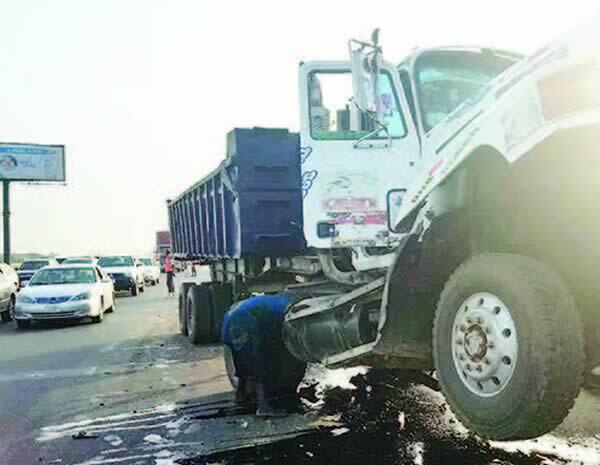 PUNCH Metro gathered that a truck, with number plate XQ 252 SMK, had developed a mechanical fault around 7am on the bridge and the driver and his conductor had gone under the truck to fix the fault when the granite-laden tipper rammed them. It was gathered that the conductor died on the spot, while the driver, who also sustained life-threatening injuries, was rushed to the Divine Touch Hospital, Ibafo, by officials of the Federal Road Safety Corps. An eyewitness, who identified himself simply as Friday, said immediately the accident occurred, the tipper driver abandoned his vehicle, with number plate DGB 216 XA, and reported himself at the Wawa Police Station. He said, “It was the tipper driver who went to report himself at the Wawa Police Station. The truck was faulty and the driver and his conductor were underneath to repair it when the tipper driver rammed them from behind. “The conductor died on the spot, but the driver was rushed to the hospital by officials of the FRSC because he was badly injured.” When contacted, Deputy Corps Commander, FRSC, Olalekan Morakinyo, confirmed that the conductor died on the spot and the driver was rushed to the hospital, adding that the tragedy would have been averted if the truck driver and the conductor had used a caution sign to warn other motorists that their vehicle had broken down.